“This saddle has been my saviour! I am a triathlete based in Colchester and I have had countless problems achieving a comfortable saddle (due to the pressure underneath) which has effected my ability to race and train to my full potential. After seeing the advert for the Rido Saddle in the Cycling Weekly magazine (April 2004), I thought I’d give it a try. I couldn’t believe the difference it has made. I am able to train much further and concentrate on pushing the pedals rather then fidgeting trying to get comfortable on the saddle. I have knocked over 2 mins off my PB for 10 miles (27.02 achieved on a sporting course) and have increased my training speed average to 19.3 mph for 25 miles. I am now confidently looking forward to my first Olympic Distance Triathlon in Cambridge knowing my saddle wont rub, especially as you have to get on the bike with a soaking wet tri-suit on! I have already ordered another saddle for my winter training bike. “I have been in hospital for a month having my prostrate and bladder removed. Before going in I was able to do a few rides on the RIDO and found it more comfortable in the “undercarriage” area than the box full of expensive saddles that I have bought over the years. “So, how was it? Well the first impression I had was ‘I’m sitting on a brick!’ It doesn’t feel immediately inviting and I thought that I would still be feeling the saddle some time after I’d stopped riding. Not the case though!! It’s a strange feeling using it: it feels hard but not as uncomfortable as my head thinks something that hard should be. Am I making sense? 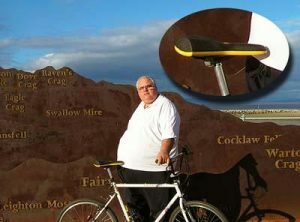 It’s asking a lot from any saddle to carry 434lbs, but with regard to nerve pain, there was none. I was impressed by how well it coped with my weight. My bike is a rudge montague folding mountain bike, much, much modified. Wheels are hand buit extra strong ones from J.D cycles Ilkley. Tyres are slikasaurus pumped up to 90-100lbs. Bars are bmx to give a more upright ride. The combination of stiff frame, wheels, upright position and high pressure tyres makes for a VERY hard ride (I suspect that I could ride over a newspaper and read the headlines in braille through my backside). I hope to get in a few longer rides in the next few weeks and maybe let my brother give it a go (he was suffering mightily from his ‘hole in the middle’ saddle today). I’ll let you know how it goes. “Thank you for the saddle. I have since used the saddle on one 30 mile and two 50 mile rides and have found it to be extremely comfortable. I regard the purchase as very good value for money and I am happy with it. “I am very pleased to say that the saddle that I have bought from you really does what you say! I have done two 30 mile runs and it is v.g. “The saddles arrived on Saturday, and I have used one on my commuting bike for the last couple of days, clocking up about 70 miles. The best compliment I can pay them is to say that I have not noticed it at all!! The only comment I have, is that it would be nice to have an all black version, as the yellow stripe jars a bit with my black and red bike! “RIDO-CYCLE SADDLES: I have purchased to date two of these seats. I think the company is based in England and they give me good dependable service. The seat is completely different than any other I have tried but seems to work well. It is not a soft comfy type of seat – it just seems to be designed in such a way as to prevent pain but no real cushy type comfort. I like them and would or will buy more from them. “I’ve used a RIDO saddle for the past 9 months and can honestly say that, once you get over the weird shape of it, that it’s the best saddle I have used. I don’t have to move around to get comfortable any more. I just get on and ride without any thought of getting sore or numb. If looks are important then you probably wouldn’t want to put it on your sleek racing stallion, but for doing a 35 mile round trip to work then it’s great for my winter/training bike. Comfort over style….. after all, no-one sees it when your sitting on it ! “Another Rido saddle in black please! “I bought my first Rido saddle 3 weeks ago and am amazed at the supportive, yet pressure free ride it achieves. I commute (on my bike) 50 miles per day and so spend many hours a week in the saddle. “If I had have bought the Rido saddle originally it would have saved me many hundreds of pounds trying to achieve a pain free ride.